Paul Krugman made 3 references to Keynes’ concept of effective demand in that 3rd lecture. The basic tone is that we need to work on making effective demand useful. It is evident that Paul Krugman has an interest and a respect for the concept of effective demand. I have developed a new model for effective demand. In future posts at Angry Bear blog, Steve Roth and I are going to be explaining what this new model of effective demand is, how it works and how it can be useful. For the moment Paul Krugman will lead us to look at effective demand. This is the part from Keynes’ chapter 3 of the General Theory book that Krugman referred to. Keynes is looking for an equilibrium between demand and supply that determines the limit upon employment. He refers to this equilibrium limit as effective demand. The principles of effective demand that I put forth state that the SRAS (short-run aggregate supply) curve and the effective demand curve will cross at the LRAS (long-run aggregate supply) curve. The LRAS curve is the notion of the natural real GDP at full-employment where output will not increase, but the price level will. The LRAS also gives us the NAIRU level of unemployment. The equilibrium that Keynes is looking for is the intersection of the SRAS, LRAS and effective demand curves. Employment will be limited at this intersection which represents potential output. Keynes wanted to tell us that effective demand can establish this intersection even at a level below what economists would consider full-employment. As Krugman explains Keynes thoughts on effective demand, the key issue is an equilibrium with effective demand that determines the level of unemployment. The graph above shows this with the NAIRU determined at the LRAS curve. “Thus the volume of employment is not determined by the marginal disutility of labour measured in terms of real wages, except in so far as the supply of labour available at a given real wage sets a maximum level to employment. The propensity to consume and the rate of new investment determine between them the volume of employment, and the volume of employment is uniquely related to a given level of real wages — not the other way round. If the propensity to consume and the rate of new investment result in a deficient effective demand, the actual level of employment will fall short of the supply of labour potentially available at the existing real wage, and the equilibrium real wage will be greater than the marginal disutility of the equilibrium level of employment. Keynes is defining effective demand as a limit upon employment. He first says that employment is not determined by the point at which business is no longer willing to pay a certain real wage, but rather by levels of consumption and new investment. Thus, if consumption and new investment result in deficient demand, employment will be capped at a level below which business would still be willing to hire more workers based on the real wage. In other words, business would hire more workers, but there isn’t enough consumption and new investment to justify it. Keynes is implying in the quote above that an increase in real wages can increase employment. How does this happen? Demand is the constraint on employment, not real wages. Thus real wages would increase and as you increase demand through higher real wages, the result is increased employment. because you have relaxed the demand constraint. 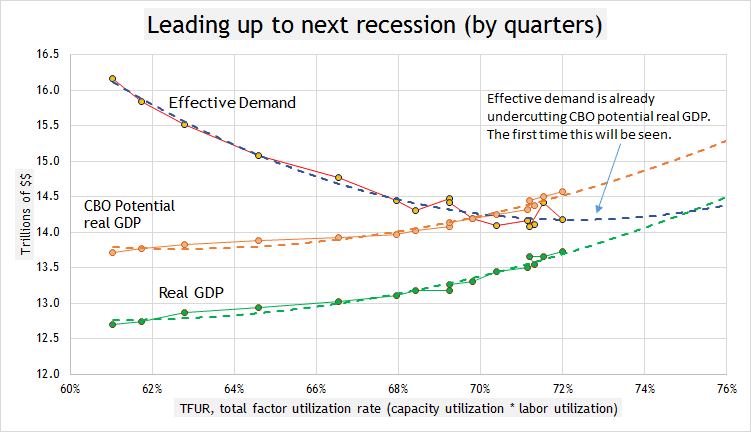 I recently posted a series of graphs looking at how effective demand determines the point at which a recession is likely to occur. So we know that the preliminary insights of Keynes into effective demand are within our grasp. 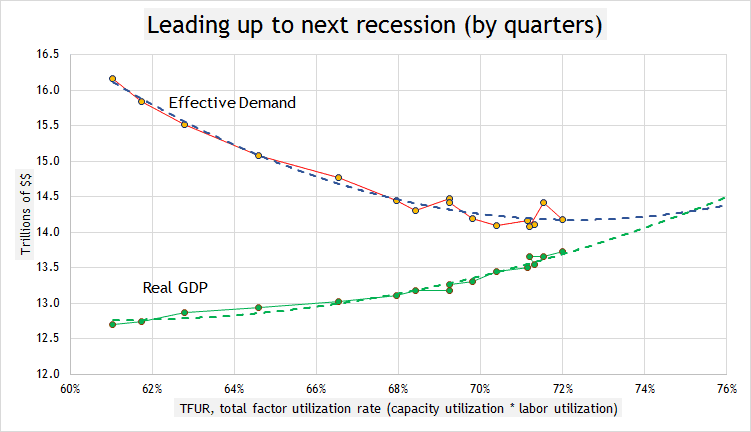 Effective demand not only sets the stage for a recession, but it also caps employment and capital utilization before the recession starts. Keynes refuted Say’s law that “Supply creates its own demand”. Keynes stated that demand determines supply. Effective demand speaks to the relative purchasing power of consumers to determine supply. For instance, imagine an economy where labor gets paid 25% of national income. The domestic market for goods would simply provide less to consumers. After all the above, what can I conclude? Krugman says we need to develop the concept of effective demand better… make it more useful. Well, 4 years later, we now have a model of effective demand; Steve Roth and I are going to work it out for you in future posts. Today Paul Krugman wrote a piece (and a blog post) about China’s high level of investment in the face of low domestic consumption. It is obvious to me that he is making headway in understanding the importance of low labor share of income. For me, he is describing the growth model of effective demand, where an economy in its early stages puts more income into capital investment and then over time must shift income to labor to purchase the production of the earlier investment. The result is an increasing standard of living. Yet, he is also describing the problem with the US economy where labor share of income has backtracked to a lower level below previous normal levels. We too have created a lop-sided balance between consumption and investment in the form of labor and capital incomes. The subject of potential real GDP is important. As Paul Krugman had a post entitled, “Potential Mistakes”. Today Dean Baker had a post entitled, “GDP Growth Remains Below Potential Growth”. The key word in this quote is “could”. This post seeks to better define what the economy could produce. We are living through unusual economic times. The bubble popped and labor share has fallen to levels not seen in a very very long time. Economists don’t quite understand that we are in a different economic reality. Constraints never seen before are now influencing the economy. It appears economists are being frustrated by these invisible constraints, and can’t coherently acknowledge them yet either. My work in effective demand is revealing constraints not yet formally acknowledged. It is generally viewed that potential real GDP is output at full-employment of all available labor and capital resources. 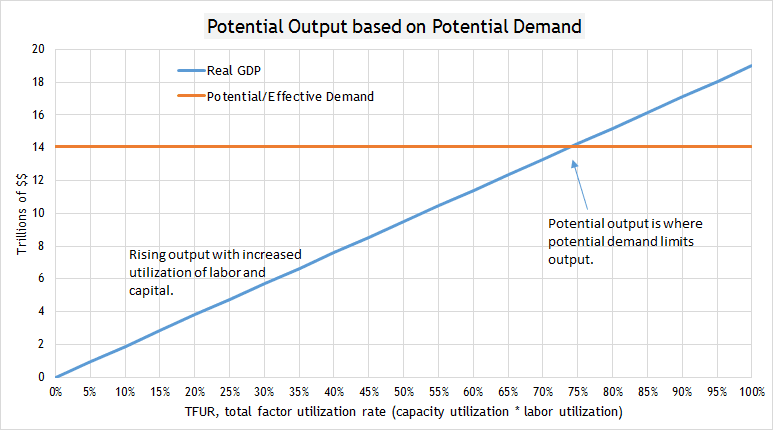 My view is that potential real GDP is the output limited by potential demand, even if all available labor and capital resources are not employed. Thus, the economy “could” produce up to the potential demand limit. For example, if you are determining potential production for your CEO, and you tell him that the factory can produce such and such amount at full-employment. Then the CEO asks another employee who did market research into potential demand, if there is sufficient demand for that level of production. And he says, “No, there won’t be demand to support that level of production.” Then the CEO wants to know what level of production “could” satisfy all the demand. It turns out that this level of production is less than you calculated. The CEO then says that the true potential production is the level constrained by demand and that this is the level around which the company will establish its policy and planned utilization of resources. When economists determine potential real GDP they do not take into account potential demand. In all fairness, they have never had to until now. I will explain this at the end of the post. TFUR does not like to be above effective labor share. 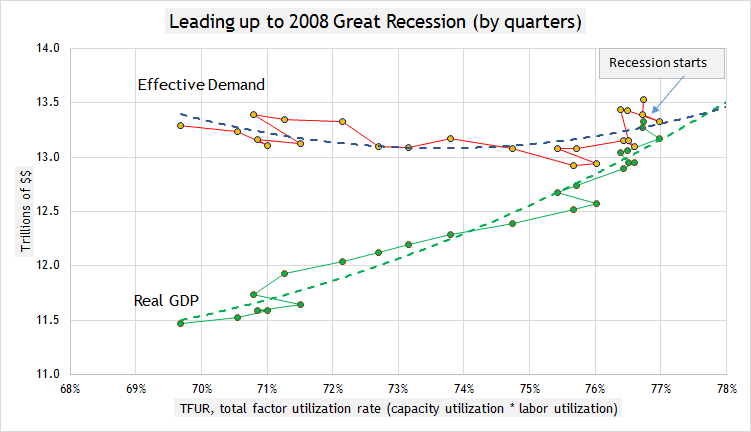 Thus, real GDP reaches effective demand when TFUR is equal to the effective labor share. Now we substitute real GDP with the equation for real output… then cancel out TFUR. Here is a graph based on a productive capacity of $19 trillion and an effective labor share of 74%. There are trillions of $$ along the y-axis and the TFUR along the x-axis. In this simple model, output rises with more utilization of labor and capital. Then output reaches the effective demand limit and will stop, unless more labor and capital are added and/or productivity increases. According to this graph, potential real GDP would be $14 trillion, because effective demand limits output at that level. Effective demand is based on 74% effective labor share. 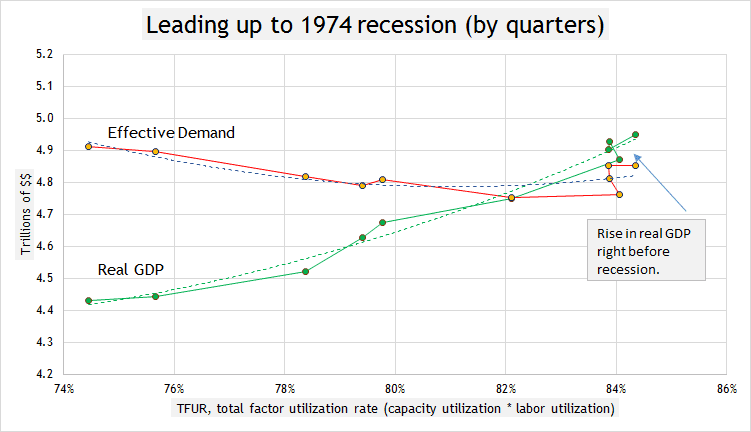 So we see real output cross effective demand at 74%, where the TFUR equals effective labor share. In a business cycle, real GDP rises as more labor and capital are utilized. When real GDP reaches the level of effective demand (potential demand), a recession would ensue. The economy will go through various changes between the time real GDP reaches effective demand and the start of the recession. This is the basic model, but how does it behave in the real world? Well, let’s apply this model to five previous recessions and to the next recession not yet seen. Graph #2 shows the quarters leading up to the recession of 1974. We see that real GDP rose as the TFUR rose. Then real GDP reached effective demand. Real GDP continued rising for 4 more quarters. The last dot is the start of the recession. Right before this particular recession, the utilization of labor and capital kept rising after the effective demand limit was reached, (TFUR kept rising), which produced some inflation. Here again, we see that real GDP (green line) rose with a temporary jump up, until it reached effective demand. In this case, when real GDP exactly equaled effective demand, the utilization of labor and capital started to fall. But there was a false start of a recession. Even though utilization of labor and capital was falling, real GDP kept growing. The recession did not start until the TFUR had fallen from over 81% to below 79%. In some ways the drop in utilization of labor and capital was a recession but technically the recession hadn’t started yet. How can real GDP keep rising as the utilization of labor and capital fall? Increased productivity, increased stock of capital, or even increased purchases of output in the face of higher unemployment. Here again, we see real GDP was rising with the increasing TFUR. 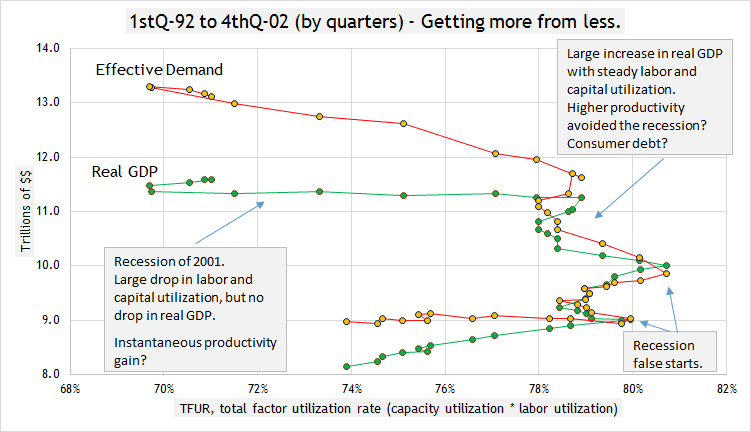 Then as the lines got close, the utilization of labor and capital fell, even as real GDP kept rising. This is similar to the case leading up to the recession of 1980 in graph #3. Keep in mind that we are seeing the potential real GDP being reached in each graph. Once that potential is reached, the economy stops increasing the utilization of labor and capital, then goes into a recession. Real GDP might continue increasing, but combined utilization of labor and capital will stop increasing. Towards the bottom we see data for 1992. We can see that real GDP (green line) was rising with the TFUR. When real GDP reached effective demand (red line), the TFUR contracted. However, real GDP kept rising. It was a false start of a recession. Then real GDP started rising again with an increase in labor and capital utilization. Then the TFUR contracted again but real GDP kept rising. We can see that effective demand kept rising with real GDP too. Finally the TFUR fell from above 78% to below 70% during the 2001 recession. Yet, real GDP still did not fall. 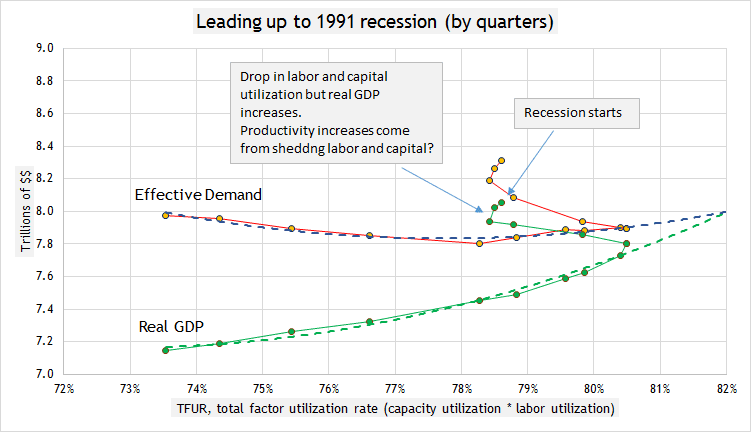 Realize again that once real GDP reached effective demand at the end of 1994, from that point on for the following years, the combined utilization rate of labor and capital (TFUR) was blocked from rising much further. This is the consistent effect of the effective demand limit. How can real GDP keep rising when real GDP is supposedly reaching its potential as constrained by potential demand? … Productivity increased tremendously from the first false start of a recession through the recession of 2001. The productivity increase came at the perfect time. 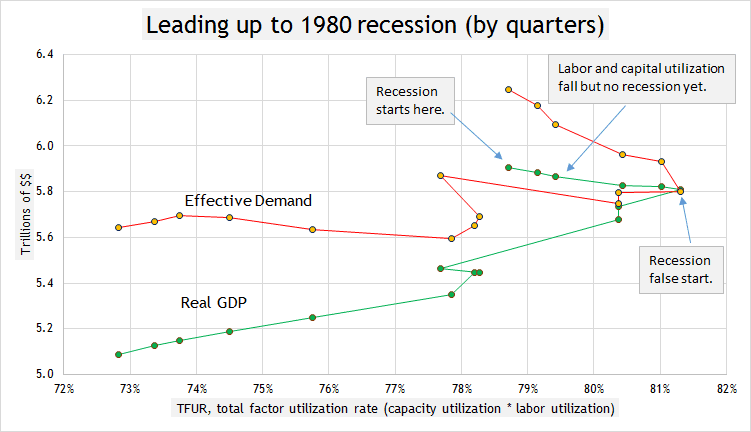 Again, we can see real GDP was rising with the TFUR (labor and capital utilization). Then when real GDP reached effective demand, it looks as though real GDP was waiting for productivity to start pushing effective demand upward like in some previous recessions. Real GDP was blocked in a tight range for two years. Productivity did not come to the rescue. Productive capacity did not increase through productivity or increased capital. Effective demand was more solid this time. For 2 years (8 quarters) we see that real GDP was hitting the effective demand limit. And then when it crossed the polynomial trend line the recession started. Some may ask why the recession started when it did. Well, effective demand was blocking further growth of the bubble and effective demand won. We need to understand why effective demand is becoming more solid. This is a graph of the quarters after the 2008 collapse up to the 1st quarter of 2013. As we can see, real GDP is rising nicely with increased utilization of labor and capital (TFUR). Effective demand is coming down to show us where potential real GDP will be. Potential real GDP is somewhere between $14 trillion and $14.5 trillion, at which point a recession would ensue, unless policy can manufacture a rise in the effective demand limit with a bubble, cost-push inflation or a new surge of productivity. Note too that the recession would take place at a lower level of TFUR (74%) than we have seen for over a half century at least. People say the economy is just depressed and needs more time to get back to trend. Be that as it may, effective demand is going to constrain real GDP at this depressed state. Economists don’t understand this yet. What does the CBO say about potential real GDP? The CBO says it is now $14.6 trillion and still increasing. Thus, the CBO presents a potential real GDP much higher than the effective demand constraint, which is not increasing into the future. The $14.0+ limit of effective demand is stationary. In fact, effective demand is already undercutting CBO’s potential real GDP, as we can see in the next graph. Effective demand did not undercut CBO’s potential real GDP in any of the previous recessions. The next recession will be a first time that effective demand will constrain real GDP under CBO’s projection of potential real GDP. Economists have never seen this before and are not aware it is already happening. Real GDP will not reach CBO’s projection unless the economy finds a way to push effective demand up. I won’t count on it, because the dotcom-bubble days of manufacturing inflated demand are over. This is the moment to recall Paul Krugman’s key word “could”. This graph #8 is showing us what the current economy “could” produce within the constraint of effective demand. What the economy “could” produce is lower than what the CBO says. We need to be aware that effective demand is more solid now because productivity has reached a plateau, investment has been lacking, cost-push inflation would be dangerous, labor share is low from low-wage jobs and unemployment is higher. Productivity tends to increase at lower levels of unemployment. How will this recession play out? Real GDP will continue to increase on the trend line in graph #7, whether slowly or quickly. Eventually it will reach the effective demand limit. I do not foresee much of a rise in real GDP once the effective demand limit is reached. I foresee a contraction in the utilization of labor and capital. There are scarce policy alternatives now to fabricate a rise in productivity or easy credit. Like Paul Krugman says, it is important to know what the economy is really capable of producing in order to set appropriate fiscal and monetary policy. And if my analysis above is correct, we should not set a potential real GDP above the effective demand limit. This is just like the CEO who takes into account the limit of potential demand to know the true reachable potential of production. The potential upside of real GDP is too dangerous to get wrong. The global economy is hanging in the balance. The up-to-now invisible effective demand limit says that economists are getting it wrong.